Now that the hard part is done with the preparation of the master stock, or lushui 卤水 (described yesterday), putting together a delicious bowl of Guilin rice noodles, or Guilin mifen 桂林米粉, is relatively straightforward. If you want to make this dish, but do not have the time or interest in making your own master stock, you can buy a bottled liquid version at your local Asian market, usually called “Chinese Marinade” or “Chicken Marinade”. 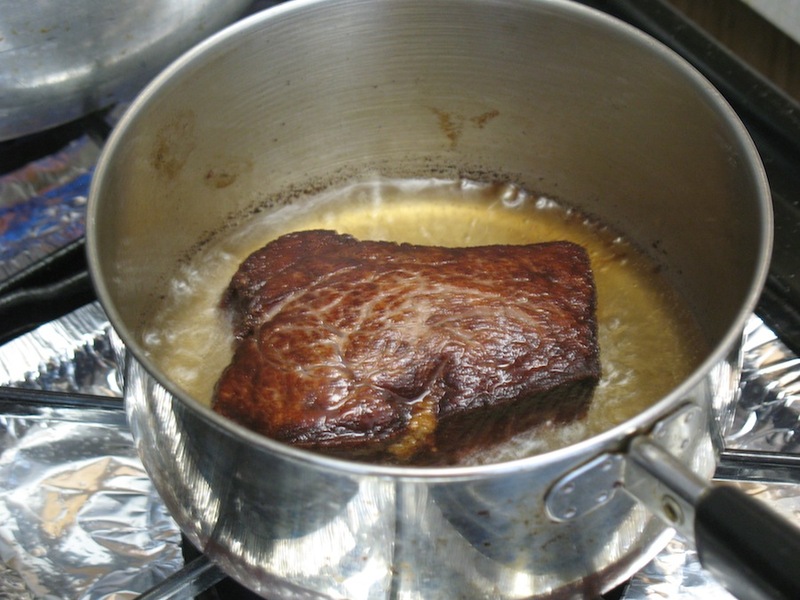 If you go this route, bring this to simmer as if it is your stock in a small pot. Choose and prepare meat topping. I chose a beautiful filet mignon (beef) from our local co-op, Weaver’s Way in Mt. Airy. I sprinkled salt on it, let it sit for a little bit, dried it with a paper towel and browned it in a lot of hot oil on medium-high heat. I seared it almost to the point of charring on all sides, for about 10 minutes. After it was crispy and well browned, I took it out of the oil to rest on a plate for 15 minutes. Since this was a thick cut, there was a nice and crispy surface on the outside, and it had nice color and texture on the inside. A roasted, braised, or even boiled meat: beef, duck, chicken, pork would also be great. Could be leftovers, doesn’t have to be extravagant. Boil the rice sticks/rice vermicelli. The names for this item can vary. 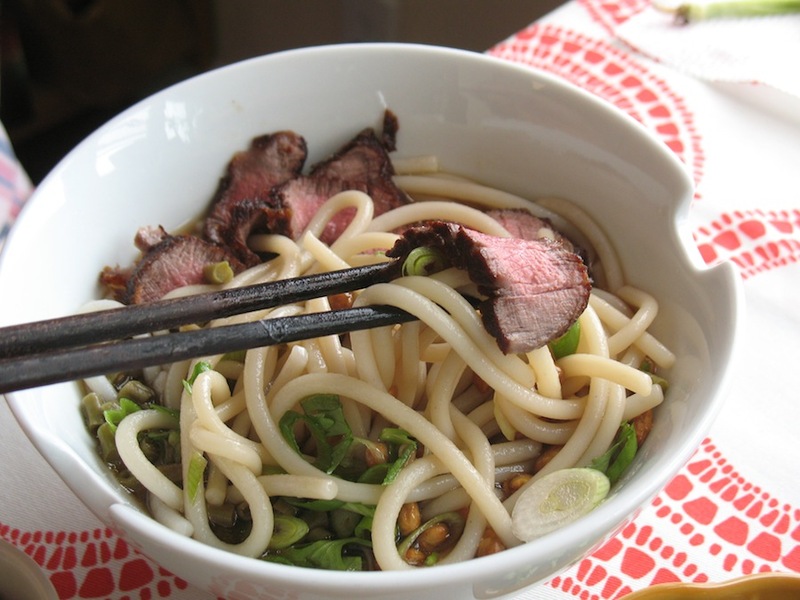 In Chinese they are often referred to as Guilin rice noodles (guilin mifen 桂林米粉), or sometimes laifen 瀨粉. In Vietnamese they are known as bún, or bánh (like the bag below). As long as the ingredients are rice and water, and if they are similar size to spaghetti, they will be perfect. Below is an image of the kind that I got, and they were too big–I prefer (in hindsight) a little thinner. Beware: sometimes instructions on the bags are way under on cooking times. For this giant noodle that I cooked today, the bag said 15 minutes in boiling water, but mine took nearly 30 minutes. They take longer than pasta or other types of noodles. They should have a little bite to them, but not too tough of course. Once al dente, drain and rinse under cold water to stop the cooking. Just keep an eye on them, stirring from time to time. Don’t let them overcook. 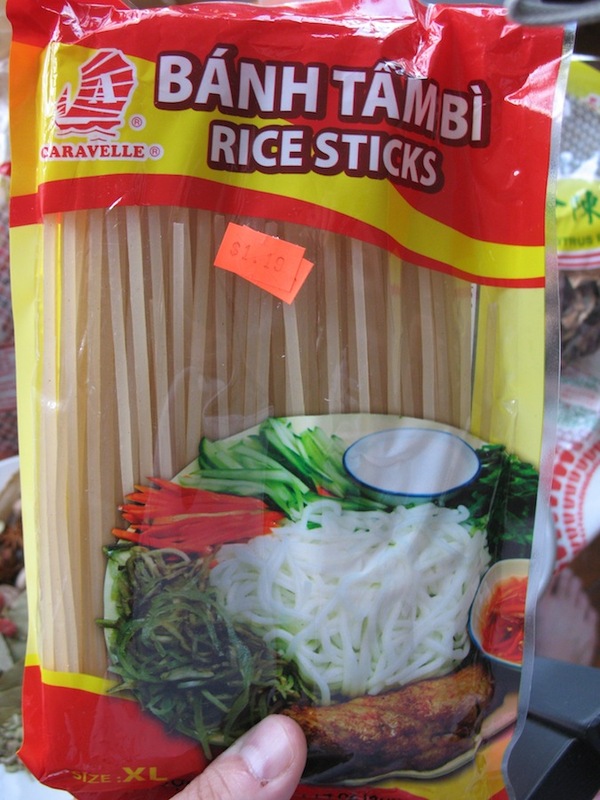 XL rice sticks. They really were! Too big. Chop the vegetable toppings. Finely chop green onion and cilantro. Choose a good pickled vegetable to accompany the noodles. The standard at my Guangzhou restaurant, and my favorite to date is pickled long beans. You can often find them in the “pickled things” section of the Asian market. I found mine at the basement market in Chinatown. Rinse the vegetable if need be. 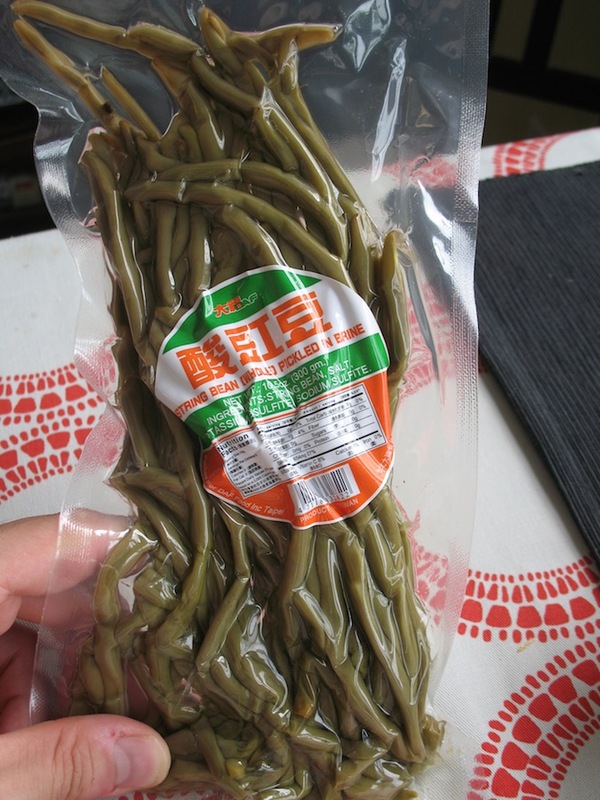 The long beans tend to be kind of briny. A rinse does them good. I’ve also had this with chopped pickled mustard greens, those are good too. Prepare crunchy nuts for the topping. Some recipes call for roasted or fried peanuts, but my Guangzhou restaurant always used fried soy nuts. I find that the soy nuts available at co-ops, Whole Foods, etc. groceries are a very suitable match. No special preparation is necessary. The ones I used here I got from Weaver’s Way co-op in Mt. Airy. Finally, assemble it all in a bowl. Noodles first. Very hot master stock second, 1-2 ladles worth. Stock should be fairly concentrated. If it is too concentrated to enjoy as a soup base, top off with boiling water or the water you boiled your noodles in to make it more palatable. Sliced meat on top, with chopped pickled veg, cilantro and green onion, and soy nuts. My finished product. Quite like how I remember in Guangzhou. This entry was posted in - Featured Food Discoveries, - Recipes, Chinese food and tagged กุ้ยหลิน, เส้นหมี่, Chinese Markets, guilin, mifen, noodles, 桂林米粉. Bookmark the permalink. This and the previous piece on the broth, excellently obsessive essay-recipes !